Beadazzled by the beautiful beadwork of far-off lands? The rich mix of culturally diverse seed bead patterns found in this book will satisfy the young beginner, the advanced worker and the holiday giftmaker. Projects result in elegant, beautiful and surprisingly fashionable pieces of jewelry you would be proud to wear on any occasion. 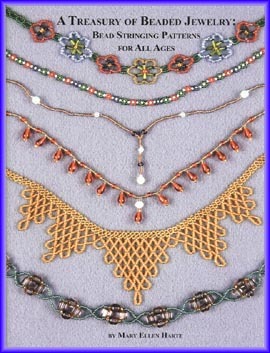 From Zulus to Guaymis, from Guatemala to Egypt, here are large graphic illustrations of the threading patterns for a wide range of beautiful seed bead jewelry, from simple Y necklaces to elaborate Romanian collars; several original designs are provided as well. This book is a must for crafters working with seed beads, providing many useful design concepts in its patterns for necklaces, chokers, bracelets, earrings, belts, pouches and headbands. The Methods and Materials section is comprehensive and full of useful hints for working with seed beads in general, from how to set up a workspace and lay out a design, to what to do when ! a flaw is found in a finished piece. Clear concise instructions alongside the diagrams ensure a good understanding of each project. The book starts out with two simples necklaces, then zooms into space with starry holiday patterns for 10 minute earrings, a necklace and bracelet. Then it's on to snowflake patterns that show how to incorporate medallions into earrings, bracelets and necklaces. Next are simple chain link patterns that turn into beautiful flower chokers. Native American patterns for flower and leaf necklaces, as well as friendship bracelets and a flowing ripple necklace, follow. After a braided headband, simple daisy chain patterns are presented, along with showing how to turn them into wide flowery band bracelets and a daisy purse. Elaborate patterns for a very regal necklace and colorful Romanian collars follow. The last patterns of the book show how to make a wide colorful Guaymi collar, a Zulu belt, a Princess necklace that will enchant little and big girls alike, netted triangle necklaces, and a Moorish necklace of netted diamonds. A cultural cornucopia of jewelry truly to be enjoyed!